Badal, Dinu, Pankaj, Manoj, Faizan, Hitesh, Komal and Vicky are eight friends who have completed their MBA programme with specialization – Marketing, Personnel, Operations, Systems and Finance. Three of them have passed with dual specializations. Two of them are having systems specialization. Operations and Systems were not offered as dual specialization with any of the remaining three specializations. Badal is third from the top when they are arranged in descending order of earning. Badal has passed with Operations and earns more than Faizan, Dinu and Komal. 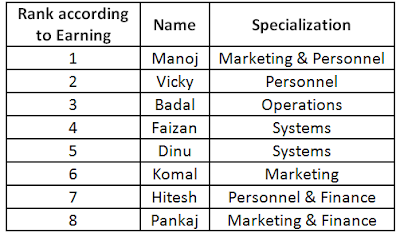 Vicky has passed with Personnel and earns less than only Manoj who has passed with a dual specialization. Pankaj has passed with Marketing and Finance and earns the least. Dinu earns more than Komal but less than Faizan. No two of them have same earning. Komal who earns more than Hitesh has passed with Marketing whereas Hitesh has passed with dual specialization of Personnel and Finance. None of these has the same set of dual specialization. 1. Who among them earn more than Faizan? 2. Who among them earns just more than only Pankaj? 3. Which of the following specializations is opted for most among them as either single or one of the dual specializations? 4. 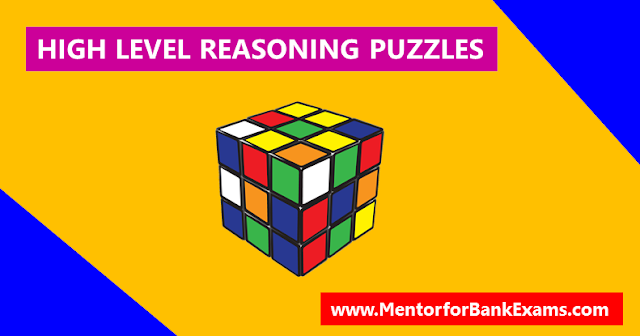 Which of the following pairs has the Systems specializations? 5. What is rank of Faizan from bottom? Directions (6 – 10): Answer these question based on the data given below. 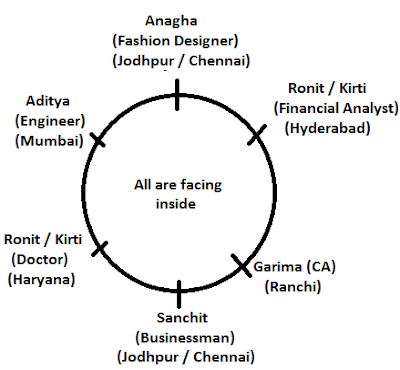 Each of six persons – Anagha, Kirti, Garima, Sanchit, Ronit and Aditya – has a different profession among Fashion Designer, Businessman, Financial Analyst, Engineer, CA and Doctor – not necessarily in the same order, and belongs to Haryana, Hyderabad, Ranchi, Jodhpur, Mumbai and Chennai, not necessarily in the same order. They are sitting around a circular table facing center. The following information is known about them. The Fashion Designer and the Businessman are sitting opposite each other. Anagha is to the immediate left of Aditya. The Doctor, from Haryana, is to the immediate left of the Businessman. The person from Ranchi and Mumbai are sitting opposite to each other and neither of them is a Fashion Designer. The Financial Analyst is to be immediate right of the CA. Anagha and Sanchit are sitting opposite each other and neither of them is from Hyderabad. Garima is from Ranchi and is to the immediate left of the person from Hyderabad. 6. In which of the following pairs, the persons are opposite each other? 7. Who is to the immediate right of the Engineer? 8. If the Businessman is from Chennai, then the person to the immediate right of the person from Jodhpur is from? 9. Who among the following could be to the immediate right of Aditya? 10. If Ronit is from Haryana, what is profession of Kirti?